Things were going well and running fine until I decided to take my friend James for a ride. 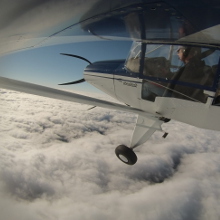 He had never been in a small plane before, so he brought his daughter, who is about the same age as our oldest, and we took off for a sightseeing hop. After about 15 minutes, the engine coughed really hard. This caught my attention and called for a calm reaction. The engine was running fine after the momentary power loss, so I selected the mixture to full rich and started heading for the airport. We landed uneventfully until it was time to taxi up the hill to get to the hangar. The engine ran fine in the idle range, but it wouldn’t run above 1500 RPM or so. Since we needed more than that to taxi up the hill, we shut down the engine and pushed the airplane back. This was certainly not the best impression for a first-time airplane ride. I downloaded the diagnostic data from the D180 and uploaded it to Savvy Analysis. After much consideration and consulting with Bob Barrows on the phone, I decided that it must have been a carburetor ice event. 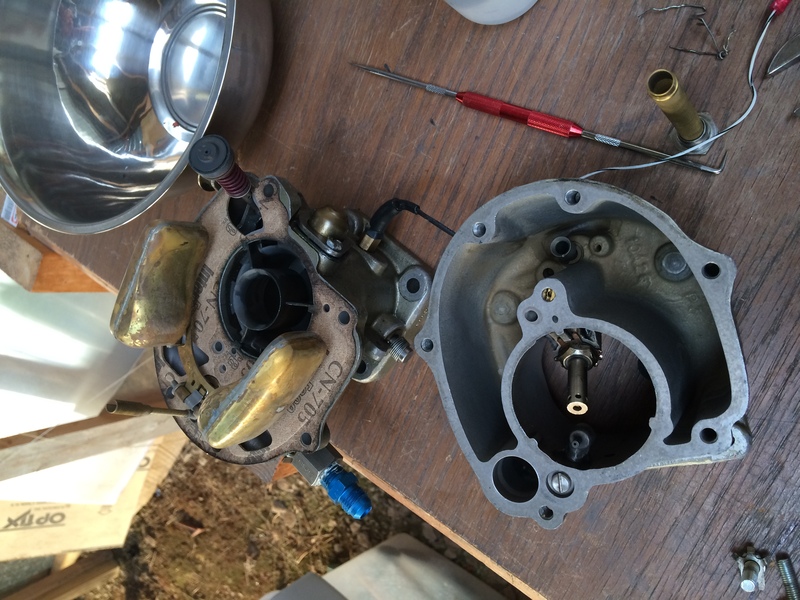 The main symptom was that the carburetor’s main jet was plugged, but the problem had gone away. The carburetor air temperature indication did not support this theory, but then again I’ve heard other folks say that theirs indicated higher than actual temperatures. At the time, the ambient conditions weren’t exactly prime for carburetor ice, but it was cloudy and about 50 degrees. I ran the engine for half an hour on the ground, making passes up and down the runway to make sure it was operating correctly. I flew solo for a short flight, and then flew for almost an hour with another friend. The carb ice theory was starting to become the most plausible. That is, until I went flying with another young couple that I had met recently. This time we were planning to fly for about an hour, but just as I was turning on what would have been a crosswind leg if we were staying in the pattern, we lost power again. Just as before, the power loss was very temporary. It was running again by the time I could do anything, without any input from me. This time we were within gliding distance of the airport, so I landed promptly, assuming it might quit temporarily or permanently at any time. After landing, the symptom was the same. Any power application above the idle range would cause the engine to quit. This time I had the forethought to try and determine if the problem was a lean mixture or a rich mixture. I advanced the throttle into the quitting range, and then rapidly pumped it back and forth over about one inch of travel, to work the accelerator pump. This worked, indicating that the problem was fuel starvation. I used this technique to taxi up the same hill to the hangar, and sheepishly apologized to yet another set of passengers. They were more understanding than I expected. This was all that I needed to stop flying the airplane until I was exactly sure about why these symptoms were popping up. I did lots more research, and found an old service bulletin about modifying the carburetor to deliver more fuel. The RV guys call this the “Mooney Mod” and it dates back to the 1960s. I asked Bob about this, and he said that was probably not related. He offered to swap carburetors with me, which was generous. 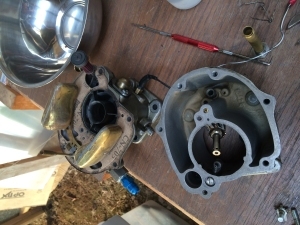 I asked what he would do in such a situation, and he said he would take the float bowl off of the carb and see if anything looked suspicious in there. We knew that it had a brass float, but I wondered if it had begun to deteriorate somehow. I felt comfortable with this, being armed with a detailed parts diagram and plenty of non-airplane carburetor experience. I didn’t really see how there could be anything in there though. After all, fuel flows from the tank, through a finger strainer, to the gascolator (which would separate out just about anything), and through a fine screen right where it enters the carb. The gascolator and carb screen were spotless, as usual. I took the carb off, which was about a 30-minute job, and cleaned off a section of work bench for surgery. You might have to click on the big version of the picture to see the little piece of red RTV. I am pretty sure that this little bugger was what was causing all of the trouble. But how did it get in there? It’s way too big to get through any of the screens, and how could it be rattling around in there for 130 hours without any other symptoms? Well, regular readers may remember a time that I removed the float bowl drain under less than ideal circumstances. The best explanation that I have is that this was when the piece was introduced. Of course that was 60 hours ago… but maybe the piece just finally eroded to a point where it could cause trouble. I put everything back together, though I misaligned the mixture parts, so the mixture didn’t work. 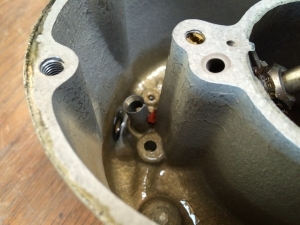 I had to drop the float bowl down again and carefully ensure that the mixture adjusting piece sticking down from the throttle body was engaged in the tube at the bottom of the float bowl. After that, everything ran great. It has been running great for around 30 hours so far, with no more problems. The takeaway is that we should be extremely careful when messing with the carburetor float bowl drain. There are so many defenses in place to keep contaminants out of there, but when the drain plug is out, those are all bypassed.